The Striped Hairstreak is scattered lightly over our landscape. Scudder’s comment that it was “widely distributed although nowhere abundant” (1889: 881) still holds today. As with so many of our species, Thaddeus W. Harris was the first to report it in Massachusetts: he found several on August 1, 1833, on Blue Hill in Milton. From them he described the regional sub-species strigosa. He wrote that in "the markings of the under side of the wings it nearly resembles Thecla Liparops,” which had been described by LeConte from a specimen (or from John Abbot’s drawing) from Georgia. But it was different enough that Harris named it Thecla strigosa (Harris 1862: 276; Index; specimens are in Harris' collection and the Types collection #26347, MCZ). Strigosa is now recognized as a northern sub-species (Pelham 2008; Harris' holotype MCZ) It has smaller tails and fewer hindwing markings than southern Striped Hairstreaks (Cech 2005 provides comparative photos). Most of our Striped Hairstreaks still appear to be the northern strigosa, judging from recent photographs (e.g. www.massbutterflies.org ), although there is variability in markings and tail length. Historically, Striped Hairstreak’s early successional edge and shrub habitat probably at first increased with the expansion of pastures and woodlots after 1650, but then declined at agriculture’s height in the mid-1800’s, and increased again as agriculture declined (Table 1). This pattern of increase-decrease-increase may also apply to Coral Hairstreak, and is perhaps why Scudder, describing the region’s fauna 1860-90, pegged both Striped and Coral as “rare” across New England (1889: 881,813). 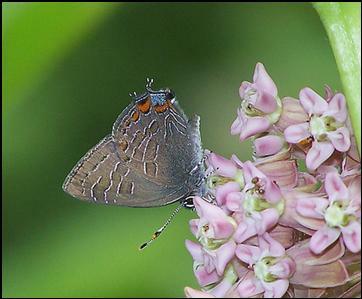 Since the 1850's, Striped Hairstreak’s habitat has been limited by the growth of cities and industry, but it may have increased in outlying areas. The plethora of museum specimens suggest that this species was not rare at the turn of the century, and it is certainly not rare today. Scudder lists Boston vicinity, Walpole, Andover, Springfield and Williamstown as locations known to him (1899: 881). After Harris' 1833 specimens, the next earliest are from F. H. Sprague, who reports collecting two in Wollaston (now Quincy) in July 1877, and one in Belchertown in 1878 (Sprague 1879; specimens not in MCZ). Several Sprague 1883 Wollaston specimens are in the MCZ, as well as five from Malden in 1896 and one from Sharon in 1897. C. Bullard also collected Striped Hairstreak in Lexington in 1897 (three specimens in MCZ). In the early 20th century Striped Hairstreak was widely collected throughout eastern Massachusetts, including from Cape Cod and the islands. On the Cape the Paine family (C. J. and J. B.) collected many specimens in Mashpee and Chatham 1919-1924 while staying at their summer home; eight of their specimens are in the MCZ. In Wellfleet in 1944, V. Nabokov collected a specimen (MCZ). There is a 1957 specimen from Harwichport at the Smithsonian. South of Boston, there are specimens from Bedford (1917, BU; 1914, AMNH) and Fall River (1933-48, UNH, AMNH, McGuire, Yale). In 1936 and 1939, W. P. Rogers collected Striped Hairstreak in Canton (Yale, AMNH; also D. J. Lennox 1939-41 specimens at UNH), as well as in Taunton in the great Hockamock Swamp (two specimens, Yale). Hagelstein collected it in Stoughton (1930, 1931 MCZ Denton mounts). For Martha's Vineyard, there are F. M. Jones specimens at Yale dated 5 and 14 July, 1944, and for Nantucket an Aug. 9, 1939 C. P. Kimball specimen at the MCZ, as well as a 1924 specimen at BU and 1938-1945 Kimball specimens at the Maria Mitchell Museum on the island. North and west of Boston, specimens exist from Boxford and Essex (1920, Smithsonian), Marblehead (1930, Smithsonian), and Stoneham (1933, Smithsonian; 7-13-1933, C. V. Blackburn, Cal. Academy of Sciences), as well as Groton (1905, BU) and Tyngsboro (1928, H. C. Fall, MCZ). Specimens from Sherborn and Framingham are noted in Farquhar 1934. For western Massachusetts, there are apparently no extant specimens to substantiate Scudder and Sprague's reports of Striped Hairstreak in Springfield, Belchertown and Williamstown. The earliest specimen seems to be that dated July 6, 1957 (Reinthal, McGuire) from Huntington (Hampshire Co.) in the Connecticut River valley. Some of the earliest specimens from Berkshire County are those of Rene Wendell, Sr.: Pittsfield, 7/10/1980 and Great Barrington 7/1/1981 (corresp. with R. Primack, 1/24/2011). The earliest evidence for Franklin County appears to be a specimen from Heath, 14 August 1982, M. D. and S. D. Coe, at Yale. 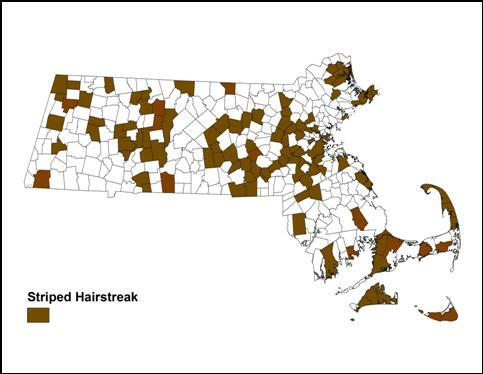 Through the 1960’s and 1970s, Striped Hairstreak continued to be collected in many locations around the state, but primarily eastern Massachusetts and the Connecticut River valley. Mark Mello collected it in New Bedford in August 1962. James P. Holmes reported it “common” on Cape Ann in early July in 1965, 1966, and 1967. In 1971 he reported that its numbers were up from the previous year, although it was still quite local. Charles G. Oliver found it “very common” in Acton in 1965, and Edward M. Peters found it common in Carlisle in 1971. C. G. Oliver 1965 specimens from Acton, Boxborough and Lexington are at Yale. In 1973, Patrick Carey found 3 worn specimens in South Hadley on July 2, and William D. Winter found it in Westwood, although it was “less common than Banded.” (Winter specimens from Westwood and Dover in 1973, Sharon in 1991 and Dedham in 1994 are at the MCZ). 1974 was said by several observers to be a “down” year for hairstreaks compared to the boom in 1973; Daryll Willis in the Holliston-Sherborn-Framingham area said that “most notable was the downfall of liparops and falacer, both abundant in 1973, but rare in 1974.” (Lep Soc. Corresp., 1959-1976). Museum specimens include Georgetown (1983, Godefroi, McGuire), Medford [Middlesex Fells] (1969, 1975, Robbins, Smithsonian), Holliston (1978, Willis, McGuire), and Milton Great Blue Hill (1985, D. F. Schweitzer, Yale). The variety of small trees and shrubs used by the Striped Hairstreak distinguishes it from the oak-feeding Banded Hairstreak. In Connecticut, the 1995 Atlas found Striped Hairstreak caterpillars in the wild on black cherry (P. serotina), red chokeberry (Aronia arbutifolia), highbush blueberry (Vaccinium corymbosum), apple (Pyrus malus), and pin oak (Quercus palustris). In Masachusetts, photographer Sam Jaffe working in areas south of Boston also found Striped Hairstreak caterpillars as singles on fresh highbush blueberry and black cherry buds and blossoms. In captivity, they also ate the young foliage (Jaffe 2009; 2010). In 2004, Mark Mello and D. Wagner found a Striped Hairstreak larva feeding on beach plum (Prunus maritima) on Nantucket, so that shrub is probably also a host in Massachusetts. Striped Hairstreak is known to use many other hosts among tree and shrub Rosaceae and Ericaceae, and also hawthorn, amelanchier, ash, birch, and hornbeam (Scott 1986). Striped Hairstreak's habitat is deciduous woodland edges and shrub thickets, including shrub swamps and woods with abandoned apple trees. It is occasionally found in urban parks. MBC sighting records rank Striped Hairstreak as Uncommon, and it is reported much less frequently than is the Banded, which is ranked Uncommon-to-Common (Table 5). Striped is reported about as frequently as Edwards’, Coral, and Acadian Hairstreaks. The 1986-90 Atlas found Striped Hairstreak in 93 of the 723 blocks searched, ranking it at the upper end of “Uncommon,” on a par with Banded Hairstreak. The Atlas published report even lists both these species as “Common,” but neither hairstreak can be thought of as common in the same sense as, say, Pearl Crescent. The Striped is less frequently reported than the Banded, but from a good field butterflier’s perspective, the Striped is still a “fairly easy butterfly to find throughout the state” (Cassie, Atlas). Chart 22 does not show any marked trend upward or downward in sightings between 1993 and 2009, only fairly small year-to-year fluctuations. As with Banded Hairstreak, the high reading from 1992 is accounted for by the unusual 1992 Foxboro NABA count of 124 individuals on 7/11/1992. If there was a local population explosion of Bandeds in that area that year, then some may have been misreported as Stripeds. Or possibly there was also a population explosion of Striped Hairstreaks. The Foxboro NABA Count also reported large numbers of Striped Hairstreaks in 1993 (44 on 7/11/1993) and in 1994 (27 on 7/10/1994), but not in subsequent years. Most NABA counts report Striped Hairstreak numbers of less than ten. The only other report larger than 25 in MBC records is from one location, and one observer: 55 on 6/30/2001, Holliston Whitney Swamp, R. Hildreth. This seems clearly to have been a local population surge. A list-length analysis of MBC data 1992-2010 found a statistically significant 55.9% decrease in number of lists containing this species, i.e. in the detectibility of Striped Hairstreak (Breed et al. 2012). Striped Hairstreak has been found in 109 out of 351 towns (Map 22), well distributed around the state. This generally accords with the picture presented by the 1986-90 Atlas, except that the species does not appear to be any more ‘uncommon’ on Cape Cod than elsewhere. Like Banded Hairstreak, Striped Hairstreak could probably be found in almost any town that is not highly urbanized. Striped Hairstreak was reported in good numbers in nearly all years 1992-2009 on the following the NABA Fourth of July Counts: Concord, Blackstone Valley, Bristol, Foxboro, Central, Southern and Northern Berkshire, Central Franklin, and Northern Worcester. On Cape Cod, Striped Hairstreak has been reported in small numbers from Bourne, Eastham, Falmouth, Harwich, Sandwich, Provincetown, Truro and Wellfleet. The Atlas found it in Barnstable; Mello and Hansen (2004) say that it can be found at Webster Farm Conservation Area in Barnstable. MBC members have found it reliably at Wellfleet Bay Audubon Sanctuary and at Horton’s in Truro. From Martha's Vineyard MBC has many records, and the Atlas had found it at Aquinnah and West Tisbury. The Vineyard Checklist (Pelikan 2002) reports it as Uncommon, with a flight period beginning a bit later (7/14) than on the mainland. Historically, Kimball and Jones (1943) had reported it as “rare” on the Vineyard, and there seem to be no museum specimens, so there may have been some increase in numbers on that island since then. From Nantucket, there were no MBC reports for many years, despite the historical specimens. Then on 6/19/2004 M. Mello and D. Wagner found a Striped Hairstreak larva on Nantucket. On 7/20/2011 a single adult was photographed at Squam Swamp by E. LoPresti (photo in Massachusetts Butterflies 37, Fall 2011). On 8/6/2012 B. Zaremba and D. Small counted 7 Striped Hairstreaks on the island. Striped Hairstreaks are most often seen as a few or single individuals, but at some locations larger numbers have been reported, indicating a good-sized colony. Two locations from which the largest numbers have been reported are Great Blue Hill Canton (maximum 21 on 7/1/2004, T. Murray), and Horn Pond Mountain Woburn (max. 15 on 6/23/2010, S. Moore and B. Volkle). Other good areas have been Belchertown Quabbin Park; Carver Myles Standish SF (15 on 6/27/2010, M. Arey); Dover Recycling Center; Easton; Holliston Whitney Swamp ( 55 on 6/30/2001, R. Hildreth); Lee October Mountain SF; Medford Middlesex Fells; Milford power lines; Newbury Old Town Hill (20 on 7/2/2012, M. Arey); Northbridge Larkin Recreation Area; Princeton Wachusett Meadow WS; Rowley Stackyard Road (6, 7/9/2011, B. Zaremba); West Newbury Cherry Hill Reservoir; Williamsburg Graves Farm; and Worcester Broad Meadow Brook WS. Like our other Satyrium hairstreaks, the Striped has a single, annual brood, flying as an adult from mid-June to the end of August: http://www.naba.org/chapters/nabambc/flight-dates-chart.asp. Unlike Coral Hairstreak, but like Banded Hairstreak, Striped Hairstreak does not seem to have advanced its flight period significantly over the 1986-2009 period, according to a study done at Boston University using MAS Atlas and MBC records (Polgar, Primack et al. 2013). However, calculations over a slightly longer time period (1986-2012) do show some flight advancement by Striped Hairstreak (Williams et al. 2014). Scudder wrote that Striped Hairstreak appears "early in July;" he had few records of captures before the 12th (1899: 883). If this were correct for Massachusetts, it would mean that Striped Hairstreak is flying considerably earlier today, a century later. The Polgar/Primack study, combining museum, Atlas and MBC records, was not able to demonstrate significant flight advancement between 1896 and 2009, but as mentioned there is some advancement in more recent years. Earliest Sightings: In the 23-year period 1991-2013, the five earliest "first sighting" dates in MBC records are 6/18/1996, Wellesley, R. Forster; 6/19/1999 East Longmeadow, K. Parker; 6/21/2010 Woburn Horn Pond Mtn. R. and S. Cloutier; 6/22/2012 Woburn Horn Pond Mtn. H. Hoople; and 6/22/2013 Woburn Horn Pond Mtn. G. Kessler. The Atlas earliest flight date was similar: June 20, 1986. Latest Sightings: In the 23-year period 1991-2013 the six latest "last sightings" are 8/30/1992 Easton, B. Cassie (also cited in the Atlas); 8/25/2000, 8/24/2003, 8/22/2001, and 8/21/2005, all on Cape Ann, D. Savich and C. Tibbits; and 8/19/2009, Rowley, B. Zaremba. Scudder wrote that "it scarcely flies after the first of August;" the latest date he had was August 14 (1889: 883). But today, it is quite frequently seen in August. Observers usually find that Striped Hairstreak flies later than Banded Hairstreak at any given location, and this is borne out statewide by comparison of the last sighting dates over the last 23 years. It also begins its flight a bit later than Banded Hairstreak. As in the case of the Banded Hairstreak, the Striped Hairstreak’s multiple plant hosts and shrub/early successional habitat are fairly common across Massachusetts. Its NatureServe rank of S5, or ‘secure,’ for the state seems warranted. It is also S5 in Connecticut, though similarly local and Uncommon there. It has been reported from some parks in urbanized areas. Unlike the Acadian and Hickory Hairstreaks, but like the Banded Hairstreak, the Striped Hairstreak's present range is wide, extending from Canada south to northern Florida, and west to Texas and the plains, so that climate warming here would not be expected to pose a problem.